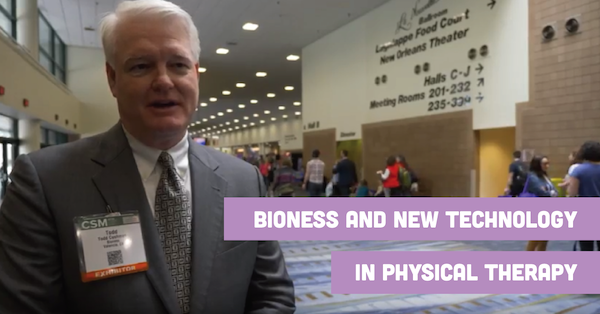 Todd Cushman is CEO of BIONESS, the biggest technology company in neural rehabilitation, and he talks with us at CSM about his company and some of the cutting edge technology shaking up the physical therapy profession. Alfred E. Mann, a legendary name in the medical devices industry and founder of 17 different medical technology companies, founded BIONESS in 2004 and the company grew rapidly from there. BIONESS offers a full line of electronic stimulation products. The company has just recently introduced the stimrouter implant for shoulder pain in patients who have recently had a stroke, as pain in these patients often localizes in the shoulder. The company is also an innovator in the fields of robotics and integrated software. Patients using the company’s products at home can measure outcomes and access data about their health in real-time. “It’s like a FitBit,” Cushman explains, adding that this level of interactivity helps patients feel more engaged with their technology. BIONESS employs 250 people, with the majority in sales and marketing. The company prides itself on it’s training programs, which educate not only staff but also hospital executives and administrators on the uses and benefits of the company’s products. Cushman says BIONESS relies on feedback from physical therapists on what products would be most helpful to meet patients’ needs. His company likes to hire physical therapists because of their knowledge and expertise in this area, as they are often more aware of what the unmet needs of patients are. Love Neuro PT?? You'll love this article! !